Don’t let budget compromise your experience in New Zealand. With a bit of planning and local knowledge you can enjoy this wonderful country in all its beauty with Escape Rentals campervan. 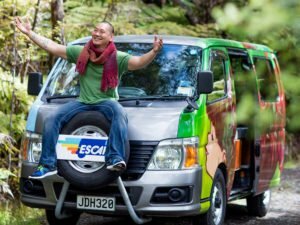 Campervan travel is ideal if you want to explore as much of New Zealand as you can. Before you rent a campervan, start by planning an amazing itinerary. 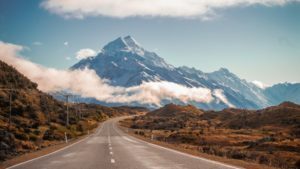 There’s a ton of resources online you can explore from previous visitors and, of course, you can talk to Escape Rentals for advice on some of the best road trips and destinations New Zealand has to offer that fit in with your budget. So, no need to sign up for that fancy tour; with a bit of research, you can plan your own adventure and enjoy the country at your own pace. When you want to experience as many places in New Zealand with the time you have, you’ll be moving pretty frequently from one place to another. 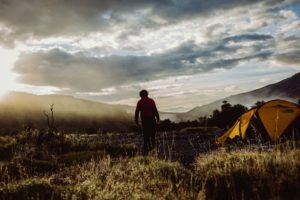 For hotel accommodation or traditional camping, that means either booking a ton of rooms or going backpacking with a tent for an extended period of time. This can get very expensive for those staying in hotels, and a constant dependency on vacancies, and, for campers, sleeping in a tent for weeks on end? Fun, but not you’re most comfortable option. When you rent a campervan, you’re essentially taking your accommodation with you and enjoying the luxury of waking up to a new view every day. No hotel beds? No problem. Once you arrive at a campsite, or a designated campervan area, simply park up, pull out the bed and snooze. Camping can be fun but hauling everything around on your back or sleeping on the ground for the entirety of your holiday may not end up being your fondest of memories. Renting a campervan is like having the best of both worlds: they’re way cheaper than hotels and just as much fun as camping (not to mention, a lot comfier). Speaking of accommodation, there are lots of affordable campsites and holiday parks all over the country. Serviced campsites can be fairly inexpensive too. These come with basic accommodation facilities like toilets, power stations, and communal kitchens etc. All Escape Rentals campervans are outfitted with a sink and we include utensils, cutlery, and ice boxes. 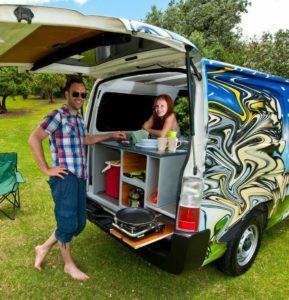 Cooking your own food in a campervan can be fun! And will save you a ton of cash on eating out in restaurants or fast food joints. Stock up at local supermarkets or find great deals at local market days. The team at Escape Rentals can recommend where to shop wherever your road trip takes you. 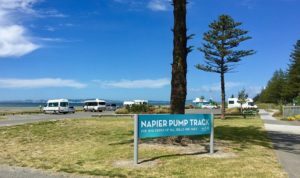 Enjoying a stellar campervan road trip in New Zealand without breaking the bank is entirely possible with a bit of planning. You already have cheap transport sorted with Escape Rentals, so plan that epic road trip adventure and experience New Zealand in all its beauty.